“What’s really behind that door?”. Students gather outside the anatomy laboratory with mixed emotions; apprehension, excitement, worry, curiosity, and with varied expectations of what it will be like. Will it smell, will the bodies be covered, will they look human, will they be whole or dissected, will they have hair, will I feel unwell or emotional? For many students, entering the anatomy laboratory for the first time is entering the unknown, something they have probably heard about, this so-called rite of passage in medical education. We have emphasised to our students the importance of anatomical knowledge and understanding as the foundations to their practicing in their chosen field of healthcare, but we must also realise that this journey of discovery in the anatomy lab will be daunting for many and in some cases confronting. For many students it will be the first time they have encountered death or thought about the realities of dying. Such experiences are challenging at the best of times, but particularly difficult for those students in their most formative of years and who have chosen to enter healthcare professions with the passion to save, preserve or improve life. I am therefore always conscious to make sure we prepare and support all our students through this phase of their learning and use approaches that combine the excitement and wonderment of seeing, feeling and understanding three-dimensional structure with the essential need for respect and professionalism. As an anatomy professor, I have had the privilege of taking hundreds of students through their first dissection experiences and introducing them to their most unusual and effective teacher. They will have never met their teacher in life, they may never learn their name or their life history, but they will learn so much from them, probably more than from any other teacher, knowledge and understanding that will be with them as a professional and used well beyond the short time they spend with their teacher. Developing this student-teacher relationship often starts tentatively with students unsure how to engage with their teacher, worried whether their dissecting skills are damaging structures and by doing so whether they are being appropriately respectful. But gradually as their skills develop, their teacher reveals more and more of their secrets and the confidence of the student grows and the relationship develops. The students begin to appreciate the natural variation between bodies, what happens when tissues and organs become damaged or diseased during life and what interventions may have been made. Such a dissection experience that focuses on exploration, anatomical knowledge, orientation and variation, as well as pathology is key, however this needs to be augmented by incorporating opportunities for developing a whole host of other professional skills and attributes, the greatest of which must be respect and compassion. Death is a loaded word pregnant with a sense of finality. Thematic throughout much of human existence, and The First Patient, it often throws what it means to be alive into sharp relief. The finality of life is deeply entangled in humans’ pursuit of meaning. Though for the wise among us, such as Albus Dumbledore, “to the well-organized mind, death is but the next great adventure”, to me the great unknown has always induced a sense of fear. Least to say, when writer-director Chip Duncan presented me with the opportunity to serve as a production assistant on The First Patient during the summer before my final year of undergrad, my excitement about contributing to a feature doc was countered by a dueling sense of dread. After telling Chip I’d consider his offer, I spent the last few weeks of my junior year of college working in D.C., frantically scrambling to finish papers, and ruminating about whether I could emotionally handle spending my summer immersed in death. Knowing that I would regret succumbing to my fear even more than passing up such an opportunity, I finally gave Chip a tentative yes. This was to be my second summer with The Duncan Entertainment Group and I spent the first few days back in the office familiarizing myself with the new archive software that allowed for the effective management of the hundreds of hours of footage the crew shot in the anatomy lab. Occasionally, I would glance over to the workstation where associate producer Theran Pfeiffer was adding metadata to footage. I tried not to pass out when whatever part of the dissection he was cataloging was particularly gruesome. I did my best to postpone logging lab footage by preoccupying myself with scrupulously cataloging scenic footage of Mayo Clinic and the city of Rochester while transcribing the interviews Chip and co-producer Vivien Williams had conducted with the anatomy students. It was as I transferred the articulate thoughts of the Mayo Clinic medical students to paper that my fear began to ebb. Many of the students were my age. And in them, I saw myself. As I listened to Maggie, Dylan, John, Nate, Amanda, and the others describe how essential dissecting a human body was to accumulating the knowledge they would need to effectively and compassionately care for patients, my perspective began to evolve. Watching individuals who were my peers (in age if not experience) pursue their calling to care for others with such tenacity as to willingly confront death, I began to realize that they were not fearless but rather finding meaning and motivation within the parameters of our physical and spiritual existence. They approached their cadavers with a sense of wonder and deeply felt gratitude. The students brought the diversity of their past experiences to the lab. For some it was the first chink in the armor of youthful invincibility, for others their awareness of mortality was already deeply entrenched springing from their previous experiences of illness and tragedy. As a passive observer to their journeys, I could see that they took the lifeless bodies in front of them and infused them with new life as they gained practical knowledge and insight into what it means to serve as a doctor and to live a fully human life. As the summer wore on, I eventually began to lend Theran a hand with logging dissection footage and I quickly became desensitized to the splay of organs and tendons on my screen. Contextualized by the students narration of their anatomy experience, the dance of bodies, dead and alive, coming together to further medical knowledge seemed beautiful rather than gross. I could see the raw materials that Chip and fellow producer Bob Huck would mold into the film begin to emerge, and I realized that the story being told was an important one in a modern world where hygiene and healthcare have rendered death distant, impersonal, and terrifying. Elbow deep in guts, the students were confronting the ultimate ending and, through adding descriptors to each scene, so was I. It was removed from the exercise of logging, separated from the lab by the impersonality of a computer screen, however, that I was again confronted by death. In the middle of the summer, Chip offered an aspiring filmmaker the unparalleled opportunity to produce an interview shoot for the film. He trusted my limited skillset far more than I did, and he let me arrange an interview with a group of individuals who all resided at a retirement community, people who were planning to donate their bodies for anatomical dissection. I was terrified. Throwing myself into the logistics of producing and really hoping I wouldn’t screw up, I shoved the fear knotting up in my chest away. The day of the shoot arrived and I had a sheet of questions that I had tried to think over without being sidetracked by nerves. The first interview was with an elderly woman whom I had not previously met. I jumped into asking her questions about why she had decided to donate her body and how she felt about death. As the conversation evolved, we touched upon the recent passing of her husband, also a body donor, and she began to cry. I felt completely unprepared. Sitting before me was a woman far older than me, or any of the medical students, still grappling with death but nonetheless willing to think about it and plan to transform her passing into a learning experience for others. Though, I can’t remember what I said, and it was likely an inadequate platitude, it was a moment that stuck with me. I have reflected on that conversation often. Her emotional response to my questions made me realize that giving voice and credence to individuals’ experiences and narratives is what filmmaking is all about. Through the production process to the finished film, it is a way to connect the individual narrative threads of human experience and help to contextualize our understanding of the big questions – questions of life, death, and what it means to be a human. Although my emerging passion for documentary storytelling may not have the same tangible impact that the soon-to-be doctors featured in the film will have, I hope that this film, and the clear-eyed, artistic efforts of our team, will shed light on donors, medical students, doctors, and everyday folks’ attempts to find value in life despite knowing that we will all die. Regardless of your beliefs about what may happen next, it is worthwhile – and perhaps even noble – to accept the finitude of our earthly experience and make a difference within that limited set of options. For some people that means pursuing a career in medicine and for others it means offering your body to be, as one donor put it, “recycled” in death. The First Patient chronicles the incredible journey medical students go through as they confront death while also preparing to compassionately maximize healthy lives for the living. But, it’s also a universal story that serves to demonstrate that there are ways to make this life valuable and meaningful. Death and resurrection are central to the The First Patient – the death of the donor leads to the life of new doctors. My small contribution to The First Patient helped me realize that there is a commonality in the uncertainty that is at the root of my fear. While death may be inevitable, living in fear of death need not be. The thoughtful students featured in The First Patient demonstrate, through the passionate pursuit of a calling and an orientation towards serving others, that meaning just might be the antidote to the perturbing finitude of life and perhaps even prepare us for the next great adventure. Like most medical students, I began my medical school journey at the Medical College of Wisconsin with a course on anatomy. 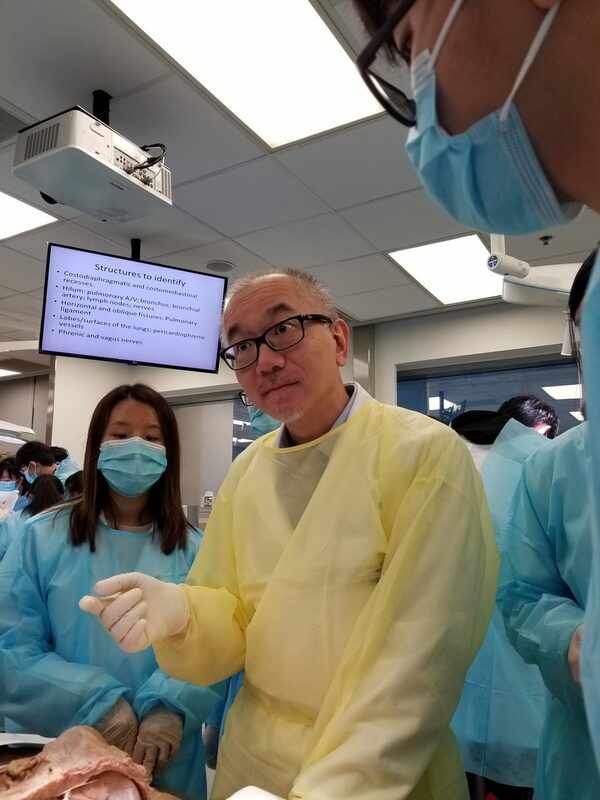 Prior to the first day, I had prepared as much as I could – watching the dissection videos, learning the anatomical structures we would focus on, and reading tips from tutors on how to be successful in the course. While I felt prepared, I was still grappling with a difficult thought – I would be dismantling a human body. As solemn as this thought was, there were several reasons why this was acceptable, appropriate, and even necessary. If I didn’t actively pull apart and understand the human body, how could I ever understand what was abnormal in a patient? I had to comprehend around what structures the heart could snuggly sit and which nerve passed through a certain region so as to prevent post-operative complications. And even more, prior to passing away, our subjects had given their consent to being dissected; they had donated their bodies with the hope to inspire and teach students. Therefore, I began this thought-provoking and transformative process much like the first year medical students portrayed in this documentary. The anatomy lab is a revered experience by all medical students as it portrays the epitome of advice consistently given by mentors, peers, and physicians – you need to know and understand what is normal – normal postures, structures, locations, textures, and sounds – so that you can distinguish what is abnormal in a patient. The film is very representative of how students develop in anatomy. Confidence in our ability to dissect improves from the first cut to the last. 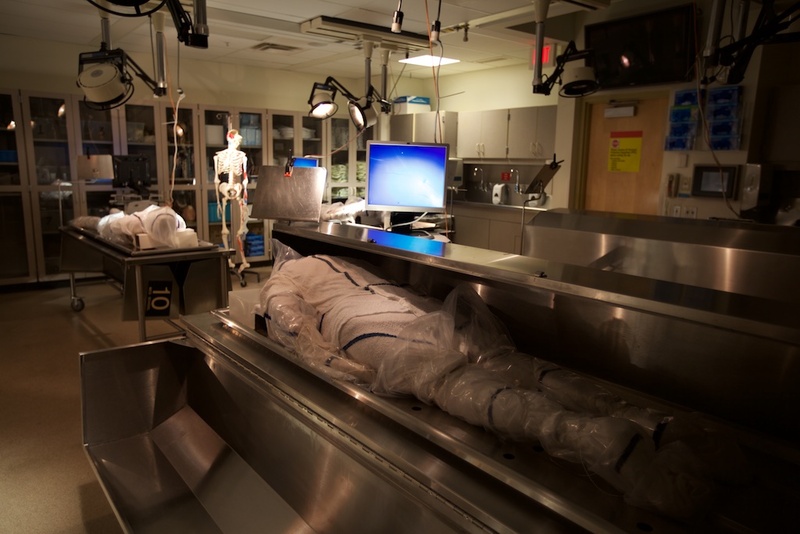 Working in small groups around the cadaver helps ease the complexity that would have been otherwise too arduous for any student to complete alone. Talking with classmates made me realize everyone had different reactions that overwhelmed them. For example, eating after anatomy lab was an interesting activity as I would have to consciously forgo thoughts of what muscles I had separated just hours prior. Yet, we were all comforted in realizing the many classes prior had completed this same journey and we were united in our desire to learn about medicine and ultimately, take care of our patients. In medical terminology, death is defined as the cessation of all biological functions. Thoughts and memories of a deceased person transcend their death and I believe this is in part why we look towards religion or fate to answer confusing and sacred questions. The documentary portrayed many viewpoints from students on the topics of death and religion. It was interesting to see the multitude of ways each student processed this journey. In the religion I follow, there is a separation of body and soul, wherein the body is just a vessel to complete the ultimate actions of the soul. So when a human dies, the soul still remains intact and might either proceed to an after-life or be re-born to wash away prior sins. And in the most basic sense, this helped separate the identity of the human being from the first patient I was dissecting. This class challenged me emotionally, spiritually, and intellectually. It helped me grow on my journey to become a doctor. 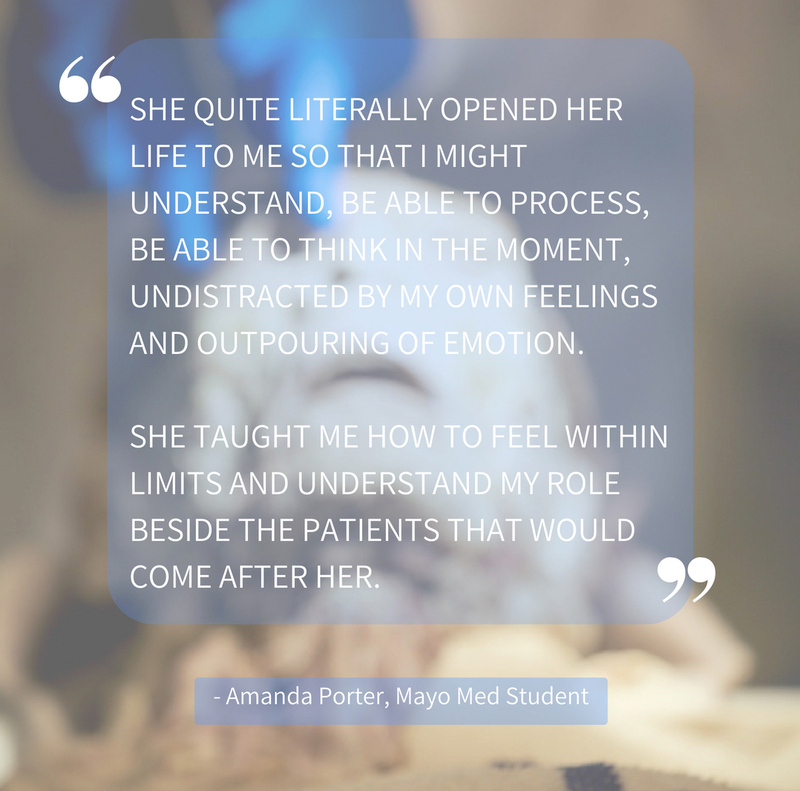 The anatomy experience is arguably the most important stepping stone in achieving the medical doctorate and The First Patient beautifully captures so much of the metamorphic progression of the first year medical students. It’s safe to say that the most fundamental and long-standing mystery we as humans have sought to solve throughout our evolution as a species is this: What are we? More poignantly: Who are we? Lately, in my personal quest to get my head and heart around this cosmological enigma, I have found much repose in the study of myth. Symbol and archetype (which we too often mistake for biography and history) are not the moon, but fingers pointing to the moon. The twentieth-century master of myth, Joseph Campbell, spoke much about the hero’s journey vis-a-vis archetype-affirming campfire stories told throughout the centuries, meant to illuminate a clearer-seeing into our subconscious: who we truly and purely are beneath the skin. With that in mind, the moment my friend, Chip Duncan — with light in his eyes — told me about his filmmaking journey with The First Patient, I was immediately fascinated by its prospects and possibilities to give us a rarely-seen vantage point into our shared journey up the mountain to stand face-to-face with the Inevitable. It conjured a terrifying invitation to dare to face and embrace my own humanity and mortality with a deeper sense of awe. After viewing The First Patient in its entirety, it definitely accomplished its task. Beforehand, Chip told me that this was the most spiritually enlightening film he has ever made. Well, I definitely get that now. While being immersed in the study of myth and archetype leading up to my viewing of The First Patient, it crystalized something I have been ruminating on: Each body is a vehicle of consciousness; our journey is ultimately unto a universal identification with who we are as a collective Self. Beneath the skin, we are ultimately made of the same stuff. Wow. If we actually owned that transformational truth, how would our reconciliation with equality, compassion, and empathy for those ‘not like us’ be revitalized? In viewing The First Patient, the dismemberment motif, where the hero is chopped to pieces (present in certain Eskimo stories, in Egyptian stories, in stories from all over) stood out to me as I contemplated the rite-of-passage journey these medical students traveled. In these stories, heroes face their shadows, their dark counterparts. In these stories the hero has to slay the other in order to enter the next world alive. Specifically seen in the story of the Egyptian god Osiris, where he’s killed, dismembered, and put together again. This dismemberment motif is seen more blatantly in the Native American story of Blackfoot, were the father of the buffalo bride is stomped to pieces, then resurrected. Through the centuries, we have depended on such myths to give us a sense of who we are, where we came from, and where we are going. A contemporary of Campbell, and another one of my literary heroes was the late, counter-culture monk and social agitator, Thomas Merton. Merton insisted, “We are already One; we just don’t know it yet. What we have to become is what we are.” There is no separateness. Thus, just as the way of social participation may lead in the end to a realization of the all in the individual — as in The First Patient’s ‘rite-of-initiation’ thread — so brings the hero to the self in all. At a time when the universal equality of all human beings is under assault, and nationalism, tribalism, and totem is uplifted as a faux litmus test for power and superiority, may The First Patient be a pinpointing scalpel that razes the masks we hide behind and invites us to face the deeper question of who we truly are, not who we want the world to think we are behind our self-fabricated Instagramatic and Maskbook faces. The hero’s journey is always one of discovery: returning back home with an elixir or healing balm for transformation & enlightenment. In my observation, this is what the medical students featured in The First Patient have come away with. Their success in this journey is not measured by a framed piece of paper that will someday hang on their walls, but a deeper awakening about our collective identity. 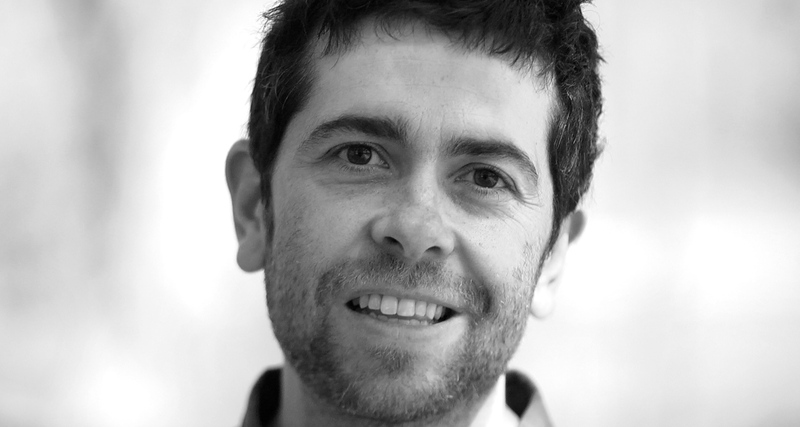 Benjamin A. Eisner is a Milwaukee-based director, cinematographer, and screenplay writer with a passion for social justice and reframing public discourse through the stories he pens. The documentary “The First Patient” introduces the public to one of the most amazing learning experiences that anyone could ever have: learning anatomy through dissection of a human cadaver. 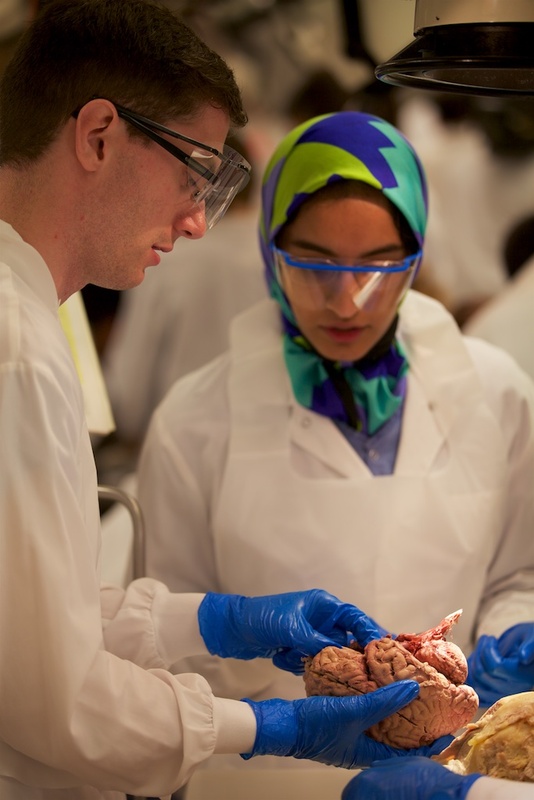 Gross anatomy class is one of the rites of passage for medical students and a significant step in the transformative process of becoming a doctor. I still remember my first gross anatomy class as a medical student at The University of Hong Kong. As I entered the brightly lit lab and breathed in its characteristic chemical smell for the first time, I was curious, excited and more than a little nervous. I had always had a keen interest in biology and anatomy, and had looked forward to the privilege of dissecting a human body and looking at its intricate structures firsthand. 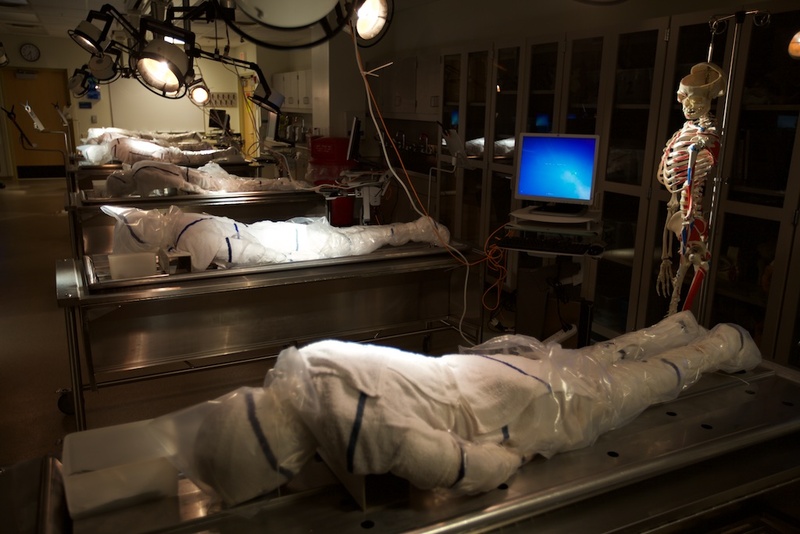 The cadavers, instead of being in body bags as they are now, lay on the dissection tables under sheets of plastic. While my classmates and I waited for the dissection to begin, I couldn’t help but quietly lift up the corner of the plastic sheet. I was 18 years old, and it was the first time I had ever seen a dead body. The old lab where I had my first class has been replaced by a more modern facility, but gross anatomy has remained the foundation of medical study. This is for good reason, as it trains students in their three-dimensional comprehension of the human body, which is essential preparation for clinical procedures they will have to do after graduation on living patients. In addition to surgery, medical imaging, diagnostic procedures and the understanding of disease processes all require a knowledge of human anatomy. At The University of Hong Kong students learn anatomy through cadaveric dissection. By having an opportunity to open up the skin and separate the structures using their hands and dissection instruments, they develop an understanding of the shape and spatial relationship of the different structures in the human body. They also learn what the different kinds of tissues feel like. Through dissection, students begin to develop the tactile knowledge they will need to perform clinical procedures. 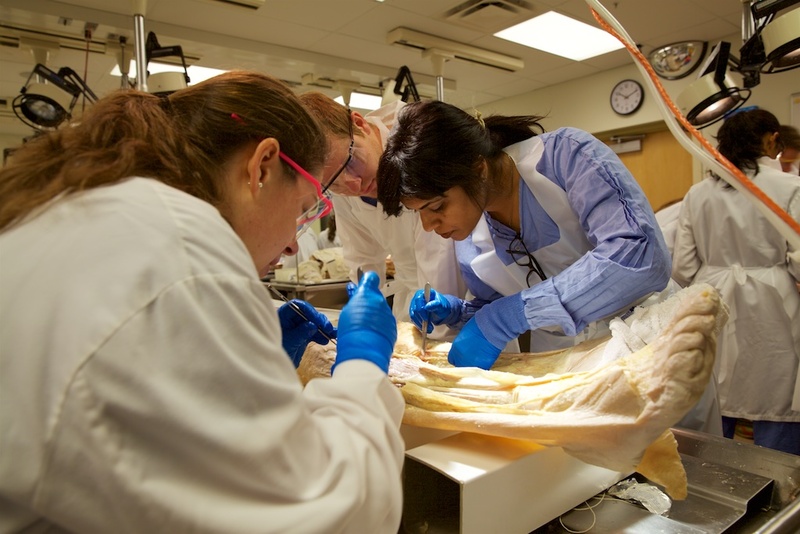 In the gross anatomy lab, students learn to recognize not only anatomical structures, but also their variations. They are encouraged to look at different cadavers and realize that there are subtle differences in their anatomy and internal structures. It is much more difficult to acquire the same knowledge from images in a textbook, or from digital models. Besides anatomical knowledge, students learn teamwork and communication skills by negotiating tasks in the dissection lab. Through the dissection process, they also learn professionalism and respect. At The University of Hong Kong all the bodies we now use for dissection are donated. We want our students to know that the opportunity to dissect these bodies is made possible by the goodwill of the donors, so we ask our students to join a respect ceremony at the beginning of a series of dissections, and then a farewell ceremony at the end. Dissection class is also an opportunity for students to begin to think about the nature of life, death and illness. In Hong Kong, students enter medical school at the age of 17 or 18, directly after completing secondary school, although a few have already completed a university degree. Dissection class gives most of them their first-ever encounter with a dead body. We want our students to realize that these bodies were once living people just like themselves. We ask our students to write an essay reflecting on their feelings about their dissection experience. As their teacher, I feel very privileged to read these reflective essays, since some of them documented profound changes as a result of learning through dissection. Many students, as a result of coming into direct contact with the dead body of a person who willingly donated his or her body for them to dissect and to learn, suddenly realize the gravity of their career: it is about the life and death of another fellow human being. The study of gross anatomy through hands-on dissection plays an essential role in the study of medicine and the development of skilled and caring healthcare professionals. As a teacher of gross anatomy, I feel proud and privileged to pass on my knowledge to a new generation of medical students. I am sure that my fellow anatomy teachers are all excited to see that “The First Patient” has made that transformative learning process visible to the public. 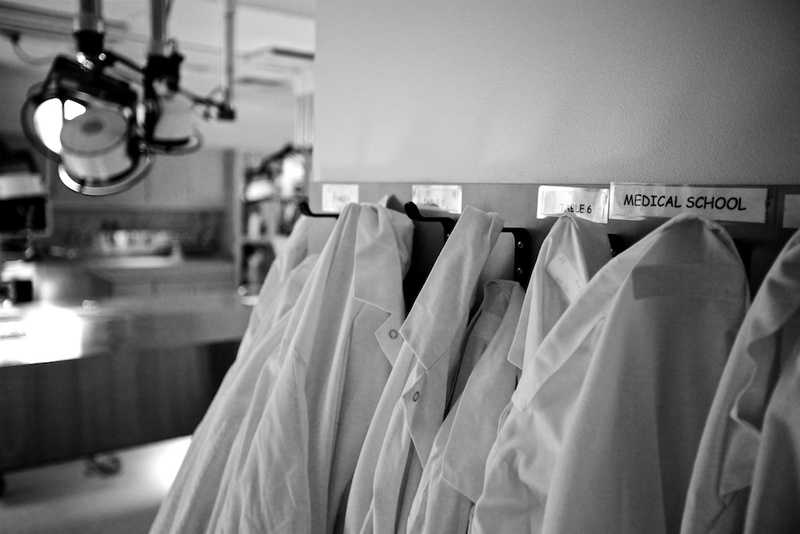 Entering the door to medical school wasn’t the one that changed my life – that distinction belongs to the door of the anatomy lab. Coming to grips with my mortality, as well as recognizing the absolute lack of visual identity below the skin, was the cost of the opportunity to hold someone else’s aorta. ‘The First Patient’ eloquently exposes this transition (part of which is immediate, part of which is a marinade much like the body in formaldehyde) that turns a fortunate, yet innocent student into a tempered physician – able to keep focus while staring death in the face. The relationship of medical student to the cadaver is most bizarre. The donor gives of her or his body to the greater good and anonymity of science; the student, having never met them living, learns the intricacies of the donor’s body in greater personal detail than anyone they’ll ever meet before or after. A relationship that leaves the student with a wealth of knowledge and forever in debt and, in any other context, would result in life imprisonment. The experience could be a traumatic horror but, properly prepared, is raw and joyful learning. Chip Duncan and crew capture the essence of physician birth. A mosaic of dramatic photography and sensitive personal reflection, this documentary singularly elevates the medical degree to a point nearly everyone will admire. Examining the promise of whole body and, by inference, organ donation, the film moves us to an altruistic point of ‘take me now!’ The student’s life and brain is forever expanded, and the viewer’s sense of what it means to be human – alive and dead – can no longer occupy the same space it once did. This is a successful attempt to explain the privilege and promise of medicine. The student’s brilliance is revealed as the donors’ light reflected. Gross anatomy lab first year of medical school stands out in my memory of those four years. I don’t remember a lot of details about other classes or rotations, but I remember everything about Gross Lab. We all showed up for medical school fresh-faced, eager, scared, and proud. We knew we didn’t know much but wanted to pretend we did. We had survived undergrad and the harrowing application process and were actually going to be training to be doctors! The Premed years were filled with stress and uncertainty: is this the right path? What does it even mean to be a physician? Do I have what it takes? Can I handle the workload and schedule? Will I even get in? Now here we were and some of those questions were still unanswered. There were four of us at each tank. We informally partnered with the four next to us and the eight of us formed a real bond: friends, future roommates, long-term connections. I am sure it was at least in part due to holding on to each other those first weeks in an environment which was radically different than anything we had ever known. The lab started that first day, like every day, with bringing the cadavers up out of the preservative. There were these levers on the tanks. When you engaged them, the cover would open and this pale, waxy body would rise up on a metal table, liquid streaming down the sides and back into the tank. Very eerie. I will never forget the smell of preservative. And it stuck with you. After lab, some of us went across the street for lunch at the women’s dorm (UW Madison Liz Waters). People would get up and move away from us! We were well coached on respecting the cadavers. These had been real people who had generously gifted their bodies for the advancement of medical science. They had relatives, loved ones, friends. In those days we weren’t told much about who they were in life. But we certainly wondered. We wanted some kind of permission or validation that what we were doing was valuable for something more than our own personal education. Would what we were doing really help our patients in the future? I would say yes. We also learned the value of teamwork. What one student saw was different than another. Some had read more, some had better visual skills, some were better with the knife, some were better at getting us to consensus. We learned to interact, trust, and come to agreement with much better results than any of us could have done alone. Most important is that we started to differentiate the person from the body. Right away we wondered “Is this still a person?” “Who was this person?” “Why is their body like this?” “What was their story?” In medical practice, there are times the body is in terrible shape, and there is not much we can do for it, but the person is whole and that relationship is rich. Sometimes the body is healthy but the mind has gone and the actual person is hard to find. It is critical as physicians that we prioritize the person we have a relationship with and not just the body we are treating. It began that first day in Gross Anatomy Lab. It was the summer of 1991 at the then “University of Durban Westville” in Durban, South Africa. The Department of Anatomy was not a highly publicized unit….nor was the anatomy program of the Medical Science Degree that each year selected just a handful of students to train as clinical anatomists. I did not quite know then at 19 what it would mean to become a clinical anatomist nor was I prepared for the incredible responsibility that would be left in my hands. But the human body, its synchronicity, its vulnerability and intrinsic ability to heal and the beauty I saw in its perfection and imperfection intrigued me……. My class consisted of four students, each of us as much in the dark as the other. We entered the building which was typically away from the rest of the university campus with its characteristic smell…no one was there to greet us and our orientation consisted of a handful of upperclassmen sharing horror stories and tall tales from the cadaver lab. We learnt fast to depend upon the well-known chalkboard in the foyer that listed the week’s readings from Lord Zukerman’s anatomy text (a South African native born in British Cape Colony and later defined by his contributions to the subject of Anatomy in Oxford and then the Royal College) for instruction. The material was detailed, it was intense and it was downright daunting. But such was the way of academic pursuit back in South Africa in 1992. Our expectations often exceed our ability, we worked hard, learnt to deal with the stress of uncertainty and found more paths than one to educate ourselves and each other. My first encounter with cadaveric material occurred in the cold, stainless steel decked laboratory of the anatomy department. The four of us sat around the table staring at a white plastic bucket that contained a formalin-fixed human brain. Not sure who will be the one to extract the specimen, my teammates started considering the democratic process of pulling names from a hat … this was my moment and I took it – I decided it would be me! That moment did not bring me a feeling of pride nor the feeling of courage, in fact, at that moment, I was driven only by my sense of responsibility … a responsibility that came with the opportunity to explore what very few would ever get a chance to explore – an indebtedness that would drive my commitment to become so skilled that I would be able to produce dissections that befitted the beauty of the human body in its most splendid form. It would take me many more years of failures, of trials and errors, of uncertainty and defeat … and many more years before I could see my successes. Such is the complexity of the human body that every dissection experience is defined by its uniqueness, its challenge, and its infinite beauty. My connection with anatomy has been built on my association with the many students, teachers, physicians, patients, artists and communities that I have the privilege of sharing my knowledge with. As my mentors have left behind a legacy, I too strive to do my best for those I serve, committed to those before us who have laid their hands in ours. Could I Learn Anatomy On a Cadaver? by Alexandra Wolanskyj M.D. As soon as the excitement of being accepted to medical school wore off, the dread of entering the anatomy laboratory began in earnest. Self-doubts were confirmed the first day of dissections. I almost quit: how could I be a doctor if I could not learn anatomy on a cadaver? But I returned the next day and the next completing a full year of anatomy and dissections. What started as dread slowly turned into fascination and awe as the mysteries of my cadaver’s human journey revealed themselves to me. I remember wondering about who this elderly woman had been; what stories she could tell of her life and that I wish I had known her. Now 30 years later as I reflect on my time as a physician, I realize that my experience in the anatomy lab prepared my mind but also my heart for the journey ahead in medicine. My profound sense of gratitude to this unknown yet fully known patient has perpetuated throughout my career…I am honored and humbled to have been so intimately entrusted to “care” for her just as I am with all of my patients who put their faith and their confidence in me every day.